← Did Rajon Rondo Really Have 20 Assists On Saturday? What you’re about to see is a pretty strong right-handed dunk from Rudy Gay, but you basically knew that already. So, I’d like to bring some attention to the remarkable play that made this whole sequence possible. It’s actually kind of subtle, and I didn’t notice it the first time I watched the video, but once I did see it I nearly stood up from my chair and started clapping. Did you notice it? The amazing one-handed touch pass by Marc Gasol, which he made while Brendan Haywood blatantly shoved him in the back? Yeah, that was some Jason Kidd sh!t from a seven-foot mammoth of a human being. I’ve long been aware of Marc Gasol’s ability to make delicate, point-guardly passes, but I’m still thoroughly impressed right now. This may have been his best dime yet. Honorable mentions to JaVale McGee, JaVale McGee, and JaVale McGee. 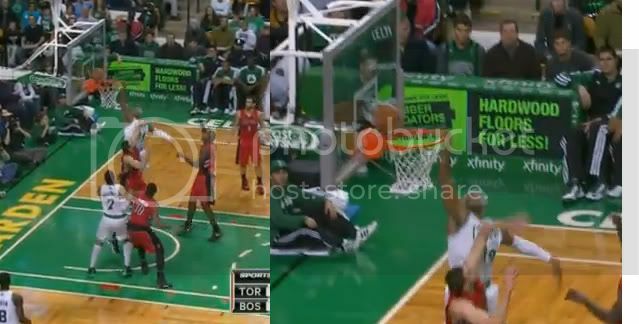 Also, I was going to roll with Paul Pierce, but his “dunk” over the oft-posterized Jonas Valanciunas actually went in off the backboard, making it a layup. Nice try, Paul.